Using a little 2” x 3.5” card to share your contact information with others is not a modern idea, although the uses and look of business cards have changed over the centuries. Even with all the changes that have been made with regards to style and technology, business cards still serve the same basic form and function they did 500 years ago. Before business cards were used for business, they were used in social situations, especially among the upper class. Calling cards, or visiting cards, were a way for visitors to let a household know who had been by in their absence, or who was waiting at the door, hoping for admittance. These types of cards were used as early as the 1400s in China, and became a must-have item in Europe by the 17th century. Calling cards often acted as a first impression, and their design was not something that was taken lightly. Personalized calling cards were printed using a wooden press until the invention of copperplate engraving and the lithograph. What was used mostly on a personal level soon found its niche in the trade market, and trade cards became a standard hallmark by the end of the 1600s. Trade cards were used to declare a person’s business and provide their contact information. They were also used to seal contracts and ensure business relationships. In the beginning, trade cards and calling cards were kept strictly separate. It was considered very rude to use a trade card in a social setting, and vice versa, so most people just carried both. Americans soon made it acceptable to use one card for all purposes, and Europeans followed suit in the 1800s. Although the elite upper class still expected to receive a specific calling card if visitors hoped to be viewed in good taste. Today, the calling card has been done away with, since we can just send a text message to announce our impending arrival or if we find someone not at home. Business cards, however, are as popular as ever, and are enjoying a creative modernization. It’s still essential to have a quick, easy way to leave our contact information, and business cards still fit the bill. A card featuring your company logo helps to increase your brand recognition. Modern printing methods make it possible to include anything you want on your business card. Screen printing makes high-quality designs inexpensive to print, and durable materials like plastic and vinyl give a permanent feel to business cards that make recipients take notice. It’s worthwhile to invest in a business card that will stand out. This is especially true if you work in a creative industry. 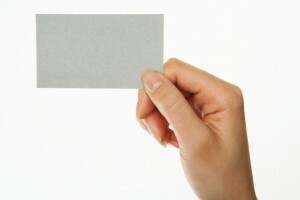 There are so many fun ways to create a business card today.